Time for another bodywash review, as you can see these two are by Right Guard, I usually equate Right Guard with deodorant but these leapt off the shelf in Boots at me the other day, particularly as they were either on special offer or one was free I can't quite remember. Of course, you'll notice that one of them has got Argan Oil in it so as a self-confessed Argan Oil obsessive, I couldn't resist it. The first one was Shower & Oils and included Argan, Marula and Almond Oil and says for Dull Skin on the packaging. I don't know if my skin was dull or not but this was certainly a lovely bodywash, very moisturising and a beautiful smell, of course I didn't expect anything less because it had Argan Oil in it and I would definitely buy this one again. The other one was Shower & Nutrients and is for Normal Skin and includes Acai Berry. Whilst it was moisturising I didn't find it as nice as the Shower & Oil and I found the Acai Berry smell a bit overpowering, I'm not really keen on fruit scents and this was really strong. So I probably wouldn't buy this one again. p.s. 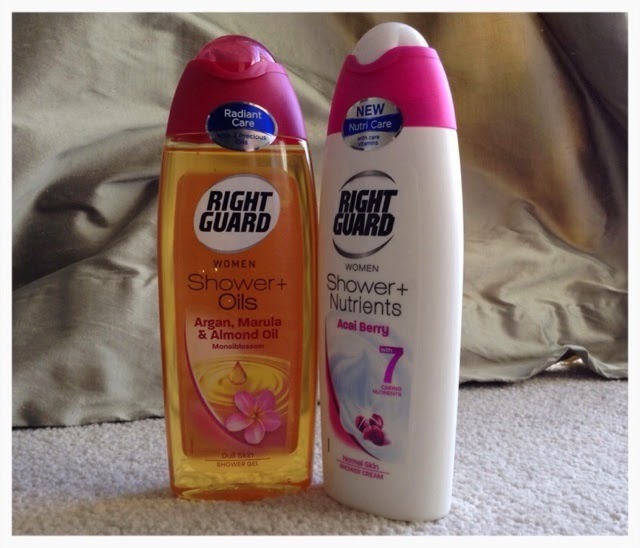 If I'm being truthful the best bodywashes I've had recently have been the ones from the Aussie range that I did a post on the other day, I'd definitely buy them again. I don't know about anyone else but I love reading blogging tips. I've been blogging for about 18 months now and my blog has been steadily growing and is pretty successful, by that I mean that people read it which I didn't think would happen when I started! So I'm happy. Always looking to improve I think we can learn from others, I love tips because you can take them or leave them if they aren't for you, I know I've read some that I've incorporated and others that I've thought were good but not for my blog. That's the beauty of it. 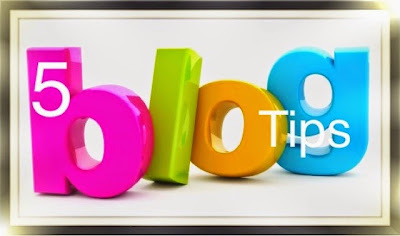 Anyway, I thought I'd share with you my top five blogging tips. This is one of the best pieces of advice I read, and luckily for me I read it early on. When I started my blog I was under no illusions that it would be read by loads of people, I just wanted to write. It is very easy to get dragged into checking statistics and I can see how you could get a little crazy about it, fretting if you don't think you're being read, or a post that you thought was particularly good doesn't get many views. I think it is also probably quite easy to feel disheartened if you aren't getting huge views like the "big bloggers" (who are all fantastic) but remember they all started somewhere so don't be intimidated by anyone else. I think that the best blogs are the ones that have their own style and are consistently written and sound like a real person. If you are happy with what you are writing then that's great, relax, be yourself and write about what you like. I like widgets. If I like a blog then I like to be able to see if they've got a Facebook page, or a Pinterest board (Pinterest is my favourite thing at the moment) or if they're on YouTube. Plus I think they fill the page out a bit and they are also a good way of advertising your blog to tell people you're out there. There are a lot of blogs out there and I mean a LOT. If someone writes something that I like and think is good I always try to comment even if it's just a short one and I love it when people comment on mine! I also try to read as many blogs as I can. We are all short of time but if there's someone I particularly like then I usually set up an email subscription so it pings into my inbox as a reminder. I think Bloglovin is good but when there's a lot of blogs and they all pile up it can get overwhelming. This is quite a good tip and one I always try to adhere to. Firstly, its good to give what you've written a bit of a spell check and a grammar check too, not that I'm any great shakes and I know I flit between past and present tenses but I try to punctuate and spell properly. I've got three primary school age kids that do a spelling test at school every Friday so I can hardly bug them about their spelling if I'm not willing to check my own! Secondly, it's a good idea to re-read what you've written just to check that what's on the page is what you wanted to write. Sometimes I write, re-read and think "how the hell did I get onto that, it doesn't make sense and its boring. Start again." Don't feel pressured to "be like" anyone else. If you want to write a blog that does mainly reviews then that's fine, if you want to write a series that's great too. It's your blog, write about what you like and what you know and be happy with it. I'm a firm believer that there is room in the blogging world (in this case the beauty blogging world) for everyone. I hope this has helped and has been encouraging, it was definitely meant as helpful and not preachy! p.s. I'm always in the market for new tips, if you've got any bring them on! When this palette arrived in the post from Superdrug.com (along with another Make Up Revolution and a Sleek palette, did quite a bit of shopping that time - oopsie) I was amazed at the size of it, compared to the superb price, was it really possible to get this many eyeshadows for under ten pounds AND for there to be so many rave reviews about them? This Make Up Revolution palette has been on my eyelids for the past week and a half. I haven't finished testing all the shades and playing about with it but what I have used I've been really pleased with (except for the purple colour on the right hand side which did not suit me at all, my colouring not a fault of the palette). I'm rarely as super-pleased with a palette as I have been with this one, I think the last time I was so chuffed with one was with my Naked Basics last year and I used that for months on end and it saw me through a sticky August holiday to Florida too. 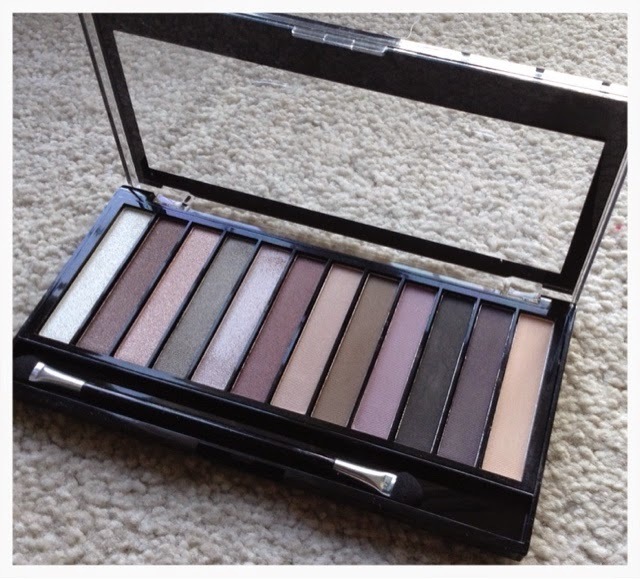 But back to this palette, beautifully named the "Redemption Pallete Romantic Smoked". There are 12 shades, half are frosted and half are matte so there's a lovely mix of shades and colours and they are easily mix and match-able, lots of day and night looks here and great colours for smoky eyes too (not the purple for me though, lol). I also used the black as a liner on the upper lid against my lashes and underneath, its not too porous so it doesn't give a harsh line it's more blended but you can build it up if you want. These shadows are pretty long lasting too, particularly with a good eye primer which I always try to use now, it just smooths things out a bit and increases the longevity of the colour. 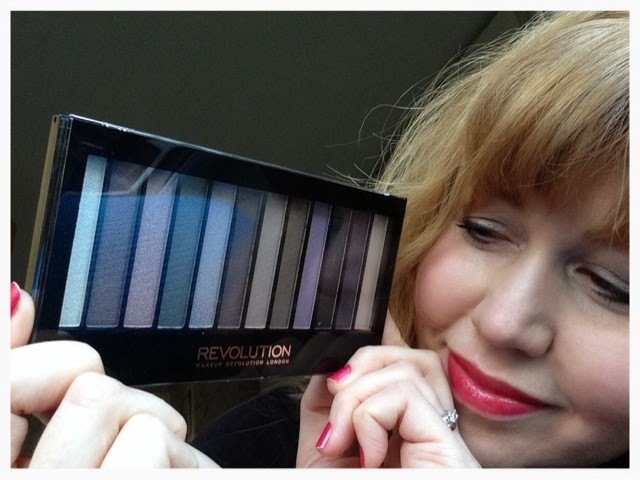 I'd read really good reviews for this palette both on blogs and on the Superdrug site and I have to say that I am adding my thumbs up as well. 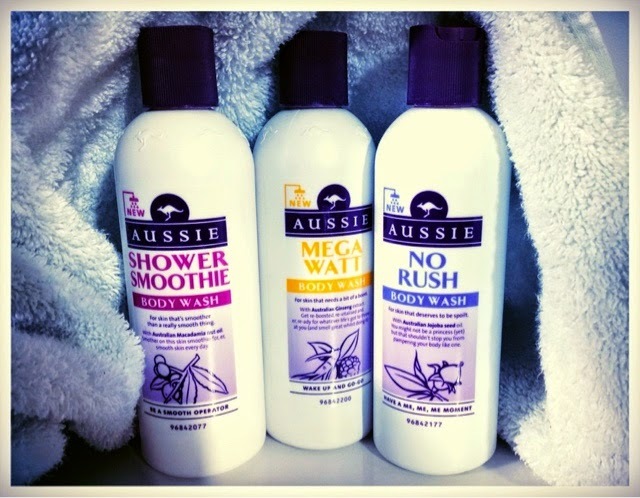 If you're a fan of the Aussie Hair Care range then you'll love this ... DRUM ROLL ... my beloved Aussie range has added shower gel to their list of products. I've long been a fan of their leave in conditioner, in fact it's one of the products that I am most loyal to, because it just works and it smells gorgeous. I was merrily perusing the superdrug.com website and saw these shower gels and my fingers clicked "buy now" immediately. I bought three, these are 250 ml and they didn't cost a lot, I think only about £1.99 which I thought was well worth it, I think they were on a special offer. As you maybe know, I'm shower gel / crème obsessed and I'm particularly picky about the smell of a gel and what I call the 'moisturisation factor', my skin is prone to dryness so if it doesn't pass the moisturising test then it's bye bye time. Luckily Aussie have passed both my tests, I think these gels are gorgeous. I particularly like the fact that the smell reflects the colour on the packaging, I love the cute names and that the colour of the label (in this case, pink, yellow and purple) is actually the colour of the shower gel inside and it all smells gorgeous. I will definitely be buying more when these run out and recommending them. It would be great if they did travel sized ones as well. Bravo Aussie! Can't wait to see what you bring out next!